Hi everyone. Welcome back to Day Nine of my Christmas Card Series for 2016. 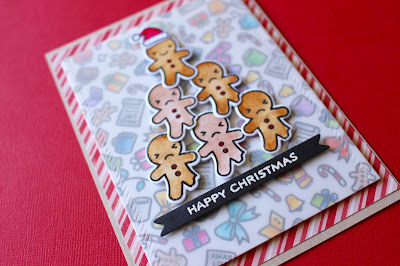 Today's card features Mama Elephant stamps and dies, to create a fun sheep christmas tree. I did this last year with a Lawn Fawn stamp set, with the little gingerbread men and thought since this set has a ton of sheep, I would do the same thing. And now onto this years card. To begin my card I stamped, coloured and die cut all the sheep from the "Wooly Christmas" stamp set. I love all these little sheep, super cute! I then could begin work on my background. I used various blue Distress Inks to ink blend on my background and then added my favourite water splotch technique to it, to sort of look like snow. I then used the "Birch Trees" dies from Mama Elephant and die cut those out of some white cardstock and then arranged them onto the background to see how they looked. I ended up cutting out five, since odd numbers look better. I then could start arranging everything. I started off with adhering the birch trees to the background and then I die cut a snow hill from the "Snow Drifts" die set from My Favorite Things and adhered that down with foam adhesive. I then layered up my sheep in a tree form using various adhesives to maintain the same height all the way through. Once everything was adhered I stamped down my sentiment using the "Christmas Friends" stamp set from Pretty Pink Posh at the bottom with some black ink and then adhered the panel to my cardbase and that finished up my card. The video will be listed below. Thanks for stopping by today, I hope you got inspired and I'll be back soon with an overload of videos, since I have so many ready to go I've just been so busy with forgetting to upload them, haha! See you then! So precious Eloise, I love it!